Matthieu Ricard had it made — or so it seemed to those looking on from outside. He was born to a prominent family in Paris. Internationally known musicians, artists, and intellectuals joined them for meals and lofty conversations. He published his first book by the age of 20. He earned a Ph.D. in cellular genetics. He wrote his doctoral dissertation under the supervision of a Nobel Laureate. To an outsider, it might seem the perfect life, and yet for him, something was missing. He admired the abilities of the great writers and performers and artists who visited his family home, and yet he noticed that these people seemed to be quite discontented. He got a glimpse of what was missing when he chanced to see a documentary film on people living and meditating in Tibet, who lived with far less material goods, yet emanated such beautiful warm smiles and a sense of happiness that seemed to elude himself and his renowned visitors. To both personally benefit and professionally study the concept of happiness, he left France and his studies to move to the Himalayas , where he studied under renowned teachers, learned to meditate, and in time became a Buddhist monk. Eventually he became the translator for the Dalai Lama when His Holiness visited French-speaking countries. The books he writes and presentations he gives help him to fund the creation of schools and clinics made of bamboo in Tibet, Nepal, and India. In recent years he has devoted much time and energy to exploring the topic of Happiness. 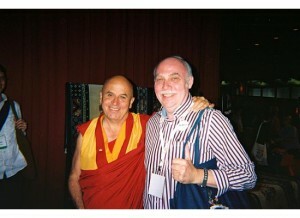 It was in Sydney, Australia that I was able to actually meet Matthieu Ricard. It was the breakfast buffet of my hotel and there he was in his bright red monk’s robes, by himself, preparing to depart. I approached him and told him that I had come from Chicago in order to learn from him. “Chicago?” he said. “Wow, that’s a long way. I guess now I have to be good.” And then he laughed, a warm friendly compassionate laugh. Instinctively, we tend to look for happiness in our possessions and outer conditions, as if the universe were a mail order catalog. I will share more of what I learned from his examination of happiness in Part Two.